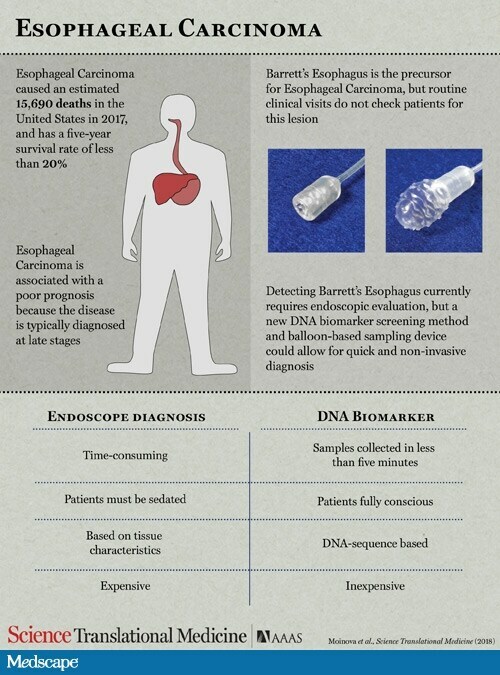 A small device that patients can swallow in any outpatient setting without being under sedation should allow for earlier detection of Barrett's esophagus (BE) and thereby prevent the development of esophageal adenocarcinoma (EAC), which can arise from these premalignant lesions. The device, which is about the size of a vitamin pill, could be used for screening instead of the more invasive endoscopy, say the researchers. It could be used as an easy, inexpensive "one-time" test that physicians can use to screen all patients older than 50 years, the researchers suggest. The research was published online ([url]http://stm.sciencemag.org/content/10/424/eaao5848.full[/url]) January 17 in Science Translational Medicine. "Our current understanding is that EACs virtually all arise from BE," senior author Sanford Markowitz, MD, PhD, Ingalls professor of cancer genetics, Case Comprehensive Cancer Center, Case Western Reserve University, Cleveland, Ohio, told Medscape Medical News. "If we could identify everyone with BE and resect or ablate the BE when it shows dysplasia, we should be able to prevent the greater majority of EACs from ever developing," he added. The incidence of EAC has "steadily increased" in the recent past, and esophageal cancer is still associated with a poor prognosis, the authors note. Patients at highest risk for BE are white men older than 50 who have persistent heartburn. Typically, to confirm the diagnosis for these high-risk patients, physicians perform endoscopy and biopsy of the target lesion. "If the biopsy shows changes towards becoming frank cancer, then the Barrett's can be removed through the endoscopy by a process called endomucosal resection," Dr Markowitz explained. Alternatively, lesions can be burned away with radiofrequency ablation or frozen off through cryoablation. The new device, which is less invasive than endoscopy, could be used to screen all individuals older than 50, instead of only patients at high risk, the researchers suggest. The team is actively seeking partners who can help them with the commercial development and distribution of their assay. National, multicenter trials are expected to be launched sometime this year. [h=3]Developing the Device[/h] In developing the new device, the team first performed a genome-wide screening exercise to identify DNA methylation biomarkers that would signify the presence of BE through a molecular assay. From this screening, they identified two biomarkers, CCNA1 and VIM DNA methylation. They tested the validity as biomarkers for BE in cytology brushings taken from the distal esophagus of 173 patients who either had BE or who did not. Using bisulfate sequencing analysis, the researchers showed that molecular cytology assays of these brushings could detect both BE and EAC with a sensitivity and a specificity greater than 90%. They then developed a novel, nonendoscopic screening device ― a swallowable, encapsulated balloon designed to sample the distal esophagus in less than 5 min. Last edited by daw; 01-26-2018, 04:33 PM. Hi, you are right with that need to continue!